Top quality and innovative technology have made Lawo what it is today: an internationally leading provider of digital mixing consoles, routing systems, video solutions and turnkey systems for the professional broadcast industry. Eclipse GT is the world’s first digital console to offer fully integrated multi-track recording via the unique M.A.R.S Multi-track Audio Recording System. The company specialises in developing essential pro audio connectivity, networking and bridging solutions for broadcast, studio, live and installed sound applications. NTP Technology develops, manufactures and distributes advanced high reliability digital routing solutions for major international radio and television broadcasters. 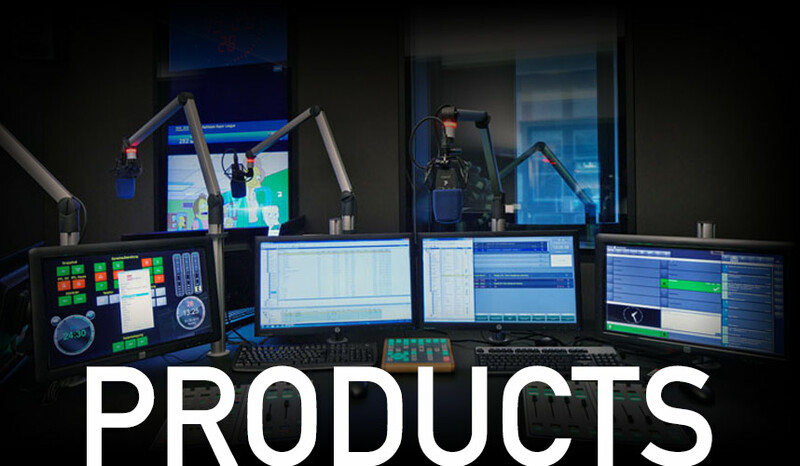 NETIA, a GLOBECAST company, is a leading provider of radio automation and software solutions that enable efficient management and delivery of content to today’s full array of media platforms. NETIA provides content management and radio automation solutions to major radio and television brands and multimedia groups around the world. Library Analysis: Helps you do the math. Audio Playback: Code attributes by ear. Listen to songs or segues as you go. Saved Song Lists: Easily create and edit your special programming and countdowns. The MediaSales suite is a complete Traffic, Billing and Sales Software Solution for Broadcast companies selling radio, TV, Cinema and digital signage advertising. Currently more than a 1,000 stations worldwide use MediaSales Traffic for Planning and scheduling of spots and breaks into various play-out systems with automated billing and reporting. Additionally, our MediaSales CRM, Connect, and Quote applications offer functionality and efficiencies for your sales staff and your traffic department. WideOrbit provides the most complete sell-side platform for managing ad sales across all business processes and media platforms, via any sales method. Major media companies rely on WideOrbit’s enterprise-wide solutions to effectively and profitably manage their operations across multiple properties, channels, and markets from a single system. Built and supported by media industry experts, our innovative leading solutions enable our clients to streamline operations, drive new revenue and significantly improve their bottom line. NOA is the leading global provider of flexible turnkey solutions for quality-controlled digitizing, management, and archiving of audio and other media content. Scalable to suit collections of all sizes, NOA’s product families, ingestLINE™, mediARC™, actLINE™ and jobDB™, not only help ensure long-term preservation of media, but also support enterprise-wide collaboration, efficiency, and productivity by enabling fast and accurate identification and retrieval of clips from the full range of an enterprise’s archive. UK Manufacturers of broadcast television talkback systems, programme Sound and custom audio equipment. Comrex has designed and manufactured broadcast equipment since its incorporation in 1961. Our product line has consistently applied the best in current technology to the specific needs of broadcasters. From the time of our founder John Cheney’s first products in the early 1960s, Comrex has had a long tradition of providing a very down-to-earth answer to a universal broadcast need – bringing high quality audio into the studio from virtually anywhere, economically, at a moment’s notice. The products developed by TV skyline are unique in the world and manufactured in-house. the strengths of our own cameras and tracking systems are continuous development through resulting needs and experiences in practice. The subsidiary broadcast-Concept has developed the Broadcast Manager software for quoting, scheduling to billing and accounting – at all levels can work processes be optimised and simplified. Quicklink offers software and hardware IP solutions for the media and broadcasting industry. Since 1994, Masterclock has been a leader in the precise timing systems industry and continues to find new areas of growth. Our time synchronisation devices do everything from ensuring smooth programming transitions for broadcasting studios to helping astronauts with timely liftoffs. We constantly improve production methods and focus our engineering talents toward custom solutions utilising cutting-edge technologies. Professional intercom system, Digital matrix frames, keyboards, audio interface. AVT Audio Video Technologies GmbH manufactures high quality audio transmission products. The product range includes systems for POTS, ISDN, Ethernet, 2-Mbit/s, X.21 and V.35 lines. The main products are Telephone Hybrids/Talkshow Systems, Audio Codecs and DAB/DAB+ Systems. Dynaudio is the leading producer of hand-crafted high-end loudspeakers created by impassioned music lovers for your living room, the professional studio. For 50 years, RTW from Cologne has accompanied the steady technological progress in the pro-audio industry with innovative instruments and technologies for visual audio monitoring in broadcast, production, post-production, and quality control. Whether audio metering, loudness metering, or signal monitoring, RTW’s state-of-the-art systems are the result of a future-oriented strategic approach that focuses on continuous development while putting maximum attention to reliability and protecting their clients investments. The product range, marketed under the brand of DirectOut Technologies®, offers solutions that build bridges between different audio worlds and make systems and formats more flexible. Audio formats supported include MADI, AES67 and RAVENNA. Symetrix has manufactured pro audio gear in the USA for 40 years. We thoroughly test each and every hardware and software product we sell to the highest industry standards. Our continuous improvement programs run deep and manifest in our legendary product reliability and long service life. Established in 2002 and headquartered in Singapore, we are a leading systems integrator of advanced TV broadcast systems and new media products and solutions provider to our esteemed customers in South East Asia. With MULTICAM RADIO your radio station becomes a visual radio. No need human intervention. The Artifial Ingelligence (AI) software module is connected to a voice detector and analyzes in realtime to do the realization for you: it’s fully automated.